The trick behind the perfect ravioli is in its dough and how that dough is rolled. If the dough is too soft or too thin, it will not hold the mixture. If the dough is too thick, the bite will be rubbery rather than tender. The rolling should be done evenly. If the dough is not rolled evenly it will cook unevenly, with certain pieces under-cooked and others will be overcooked. The thickness of the rolled-out ravioli dough should be similar to a regular chapatti or a tad thinner than the chapatti. On a flat surface, take flour, make a well in the centre and add egg and salt in it. Mix and make a hard dough. Add a little milk to bring the ingredients together if required. First, the dough should be stiff. Cut 1/3 of the dough out and cover the rest with a wet cloth, set aside. 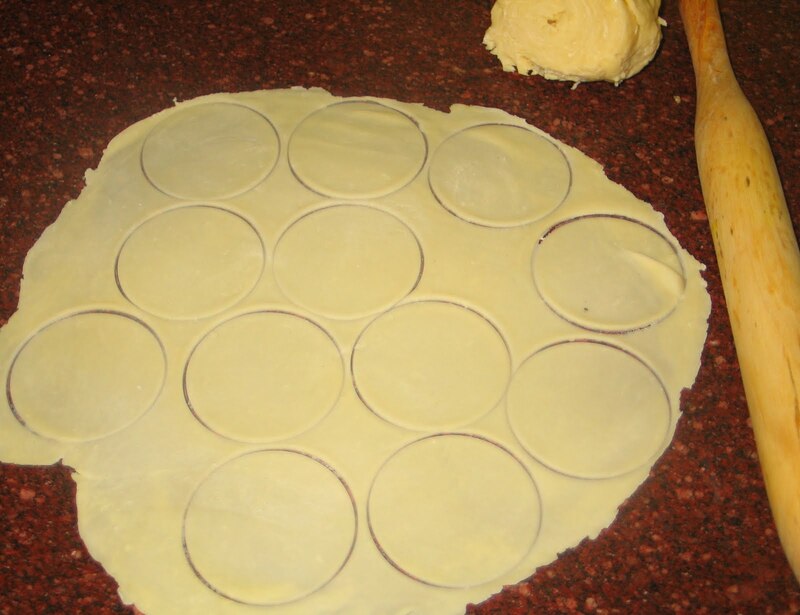 Take 1/3rd cut portion of the dough and roll it out on a flat surface with a rolling pin. 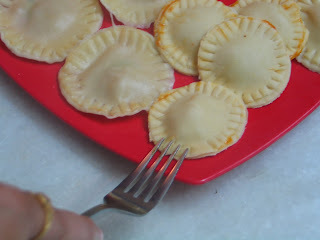 Third, make sure the rolled out dough is thin so the ravioli is soft to bite however, it should be thick enough to hold the mixture. Ever tried a thin chapatti? It should be the same thickness as a chapatti. Take a round cookie cutter or a round bowl with a thin rim. Fourth, cut same size circles out of the dough. Cut even number of pieces. Similarly Cut 1/3rd of the remaining dough, roll out and cut out circles of the same size. Finish the entire dough by repeating this process. Remove the eye of the tomatoes and make a cross incision with a sharp knife on the base of the tomato. Boil water in a deep pan and add these tomatoes to the boiling water and allow them to cook for two to three minutes. Remove the tomatoes from the water and remove the skin and seeds from the tomatoes. Chop the tomatoes finely. In a bowl, mix wine, paprika, shredded basil, salt, sugar and the chopped tomatoes. Mix well and allow the flavour to soak into the tomatoes for a few minutes. Place 1/2 teaspoonful of this mixture in the centre of alternate circles cut out of dough. Place another circle on top of it. Sixth, seal it by pressing the sides together with the back of the fork. To cook the ravioli, boil water in a deep pan. Once the water starts boiling, throw in the ravioli into the boiling water, three at a time. Seventh, when the ravioli is cooked it will pop up to the surface of the boiling water on its own. Remove the ravioli one by one as they are cooked. 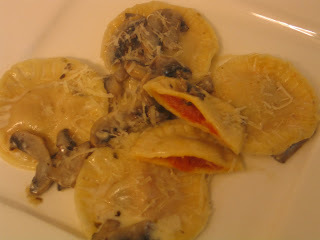 Once the ravioli is cooked, set it aside. Eighth, do not overlap, place them away from each other to prevent them from sticking to each other or sprinkle a film of oil to prevent them from sticking to each other. Heat butter in a pan, add in garlic, and allow it to turn golden brown. Add in the sliced mushrooms, salt and oregano. Allow the moisture in the pan to dry out completely. Allow the mushrooms to cook until they turn a shade darker. Once the moisture dries out completely, add in the ravioli and stir gently, to prevent the ravioli from breaking. Turn off the heat and add in the cream. Stir and serve hot with grated parmesan cheese.